Snohomish High School DECA students are raising money to pack 150,000 high protein, high vitamin and mineral meals to fight hunger. Monies raised will help the students pay for the ingredients to pack protein-filled, highly nutritious meals to give to local food banks and send overseas in an effort to fight hunger locally and globally. This year, the meals will go to local families and to Haiti which is the poorest nation in the northern hemisphere. More than 100,000 children are suffering from the adverse effects of malnutrition in Haiti. This is the third year Snohomish High School students have decided to undertake this feeding project. In addition to the packing event nine high school students and four adults, including high school DECA advisor Ben Doucette, traveled to Haiti during spring break (April 2-6) to see first-hand the impact of their project. 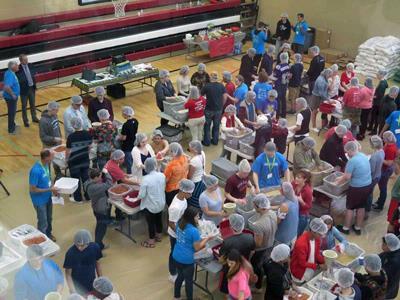 Students will pack the meals at Snohomish High School on Wednesday, May 9.